I’ve reviewed quite a number of Transcend products and if you noticed, Transcend has always kept Apple product users in mind. The StoreJet 100 in this article is just like any of the other StoreJet from Transcend BUT it’s pre-formatted for the Mac OS’s file system which is HFS+. As you can see the design is same as the other StoreJet models, the key difference is just the color, one that suits’ Mac products. That aside, here are the contents from the Transcend StoreJet 100. 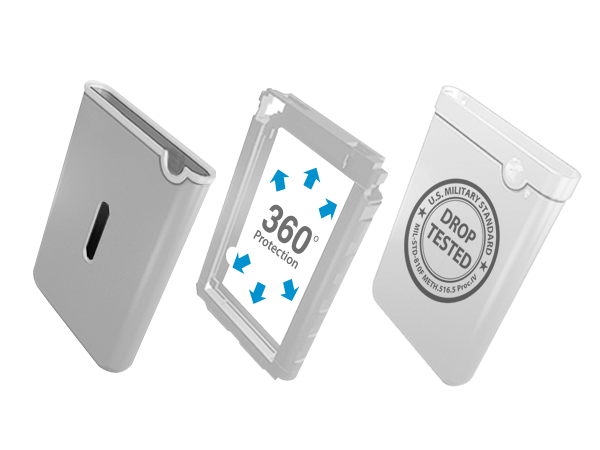 As with the StoreJet range, the Transcend StoreJet 100 is also with military grade protection to keep your data safe and sound. Transcend StoreJet 100 worked like a charm, connect it to Mac OS and it immediately asks whether one wish to use it for Time Machine. Once set, you’re good to go and you are able to remove it any time should you decide not to use it as backup. That aside that’s pretty much nothing else about it – it’s an external storage that’s made for Mac OS and one that doesn’t require you to think what to format as. Plain and simple, that’s how it’s suppose to be. Oh that aside, it still works with Transcend’s ELITE software and the one-touch backup function is still available on this product. The Transcend StoreJet 100 retails at around RM 550, it’s a great external storage with 2TB capacity and Transcend’s warranty and protection. Visit the official product page for more details. © 2007 - 2019 goldfries.com | Powered by WordPress | Theme by goldfries | 70 queries in 0.283 seconds.